What do you know about these 4 fascinating leaders? Part of being an effective leader is being able to gauge your audience. That’s an oversimplification; what I mean, is, that it’s important to understand your team members and how to know how to motivate them. Irrespective of leadership styles, knowing how to speak to your team and keep them motivated and on task is part of being a leader; the key competency here is ‘listening.’ Being able to listen to the team and take down roadblocks is all part of being a great leader. While the list of leaders is really endless, we’ve put together 4 here that really stand out. Bono has led the Irish band U2 to great success since the mid 70’s. Their music has transcended generations and Bono has inspired nations. He is named as one of the world’s greatest philanthropic performers and has inspired nations to write off debt to poverty laden countries. Fewer people have been as effective at shining a light on poverty and raising global awareness. Bono has taken the adage that leadership is about insipiring and empowering others around him; he leads the ONE Campaign, a global organization leveraging Big Data to influence government organizations and C-suites to raise millions of dollars for people living in poverty. Its 7 million volunteers have spent 10 years faxing, writing, tweeting, calling and visiting decision makers to deliver on their funding commitments. 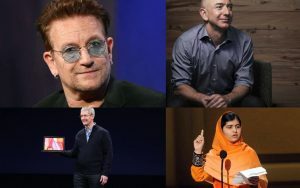 Their training is extensive and Bono’s message rings clear: you are the leaders of change. Jeff Bezos is Amazon‘s founder and CEO. He is a highly demanding leader yet thousands aspire to work for him. Of his leadership style he says, categorically, that to him, price, the speed of delivery and selection are things that will matter to the Amazon customer in 20 years. That is what they focus on. Bezos has practiced this: in 2016 Bezos was named as Fortune’s number 1 leader; in 2016 alone Amazon’s sales jumped 20%. This alone is indicative of his stance on looking to the future and focusing on what matters most for your business. Tim Cook, CEO of Apple, became the leader for digital privacy earlier this year when he took a stand against a court order to allow access to a user’s device. Malala has inspired nations and raised awareness around a global gender diversity issue: that 61 million girls around the world don’t have access to education. Malala advocates for the right to education for every child even “the sons and daughters of the Taliban.” She never dreamt of taking vengeance on her attackers; in 2014 Malala received the Nobel Peace Prize as a human rights activist. Get the behind-the-scenes HR strategies from our team to create, build & sustain your small or medium-sized business.